It’s a cold, clear winter morning up here on the Highveld and in place of the usual shivering and gritted teeth I’m singing, and sweating. The speeds are hovering around the 120km/h mark but I’m protected from the icy wind blast by an electric screen I’ve adjusted to perfection, and the stereo is pumping out a series of my favourite tunes, all clearly audible even as I overtake the lethargic morning traffic. 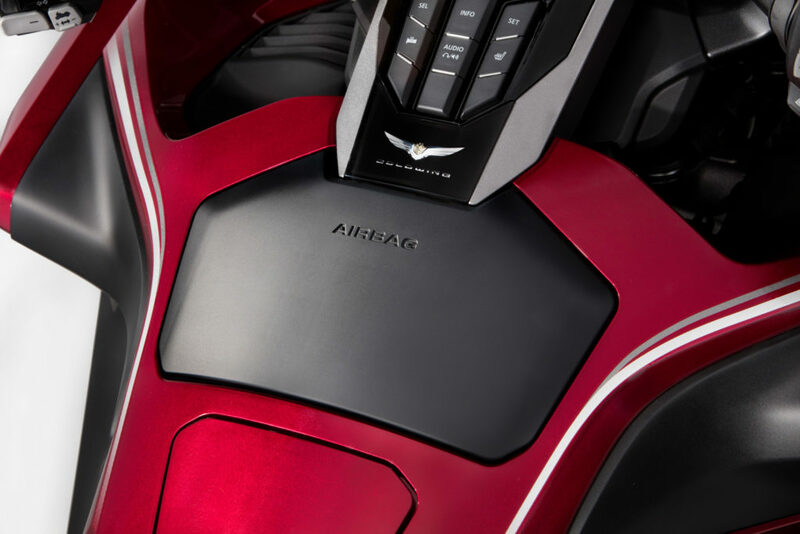 The five-level heated seats (and a heated backrest for the passenger) and grips are doing a fine job of keeping me warm and my mood elevated, and I get a surge of adrenaline every time I twist the throttle for a quick leap past the many mobile chicanes known as cars. 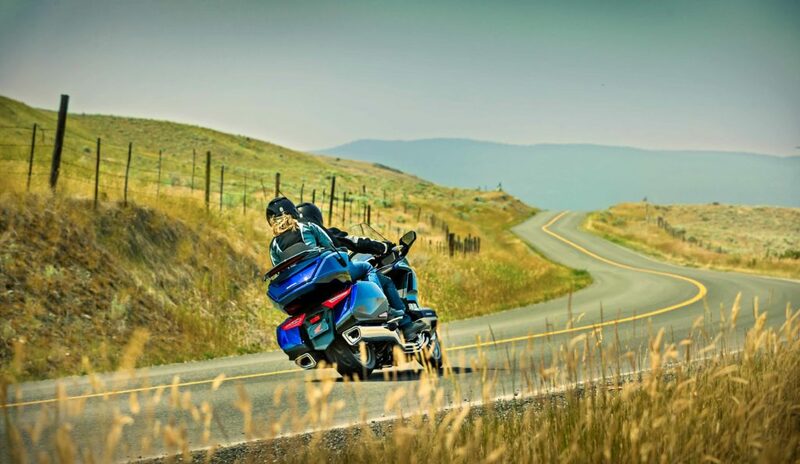 The bike responsible for this unlikely dawn mood-enhancement is the latest version of Honda’s Gold Wing. 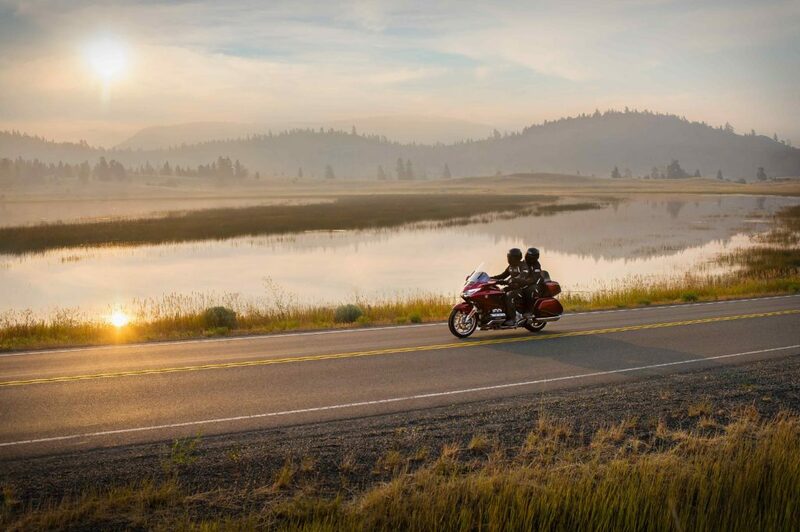 First debuted back in 1975, and last updated in 2001, the Goldwing has always epitomised the grand-touring element of biking, but over the past decade or more it had fallen far behind its German opposition – the BMW K 1600 GT L.
I knew this new model was due to arrive, but I wasn’t expecting this; a bike that is every bit as good as its competitor and in some ways even better. The ingredients haven’t changed too much, but the execution most definitely has. The engine is still a boxer six-cylinder monster, but with enough upgrades to add just over 7Kw to bring the total to 93Kw. This is way down on the 119Kw of the BMW but it really doesn’t feel like it’s missing out. Progress is still ridiculously rapid for a bike this large, and the smoothness and soundtrack feel like they’ve raised the bar. 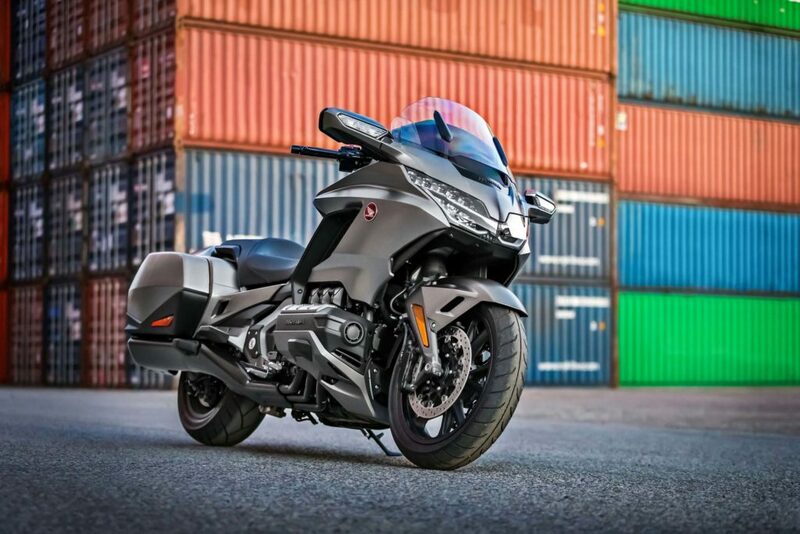 The 2018 Gold Wing feels more svelte. Perhaps the greatest edge the Honda has over its BMW nemesis is its DCT gearbox, now fitted with seven ratios. This is basically an auto gearbox that can be set in any one of four modes – Sport, Tour, Economy and Rain. 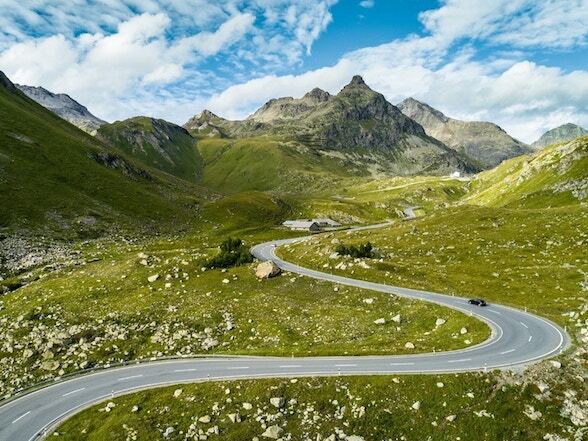 These preset options influence how quickly the next ratio (up or down) is engaged; Sport will see lower gears held onto for longer for increased acceleration, and they will be engaged sooner as you brake, too. I generally opted for Tour, with the gears arriving earlier in the rev range while still maintaining a decent rate of progress. Give the throttle a determined twist, even in this mode, and the gearbox will drop down one or two gears and provide the acceleration you need. Or you can prod the ‘+’ / ‘-’ buttons and force a change yourself. 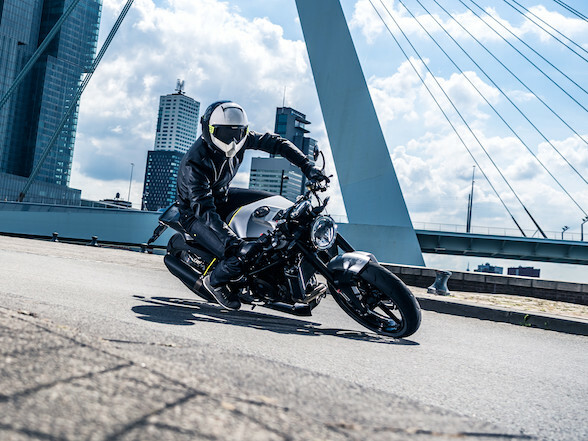 The gears are swopped with a level of smoothness even the most skilled of bikers can’t hope to match, and so the passenger is going to enjoy a smoother riding experience than ever before. 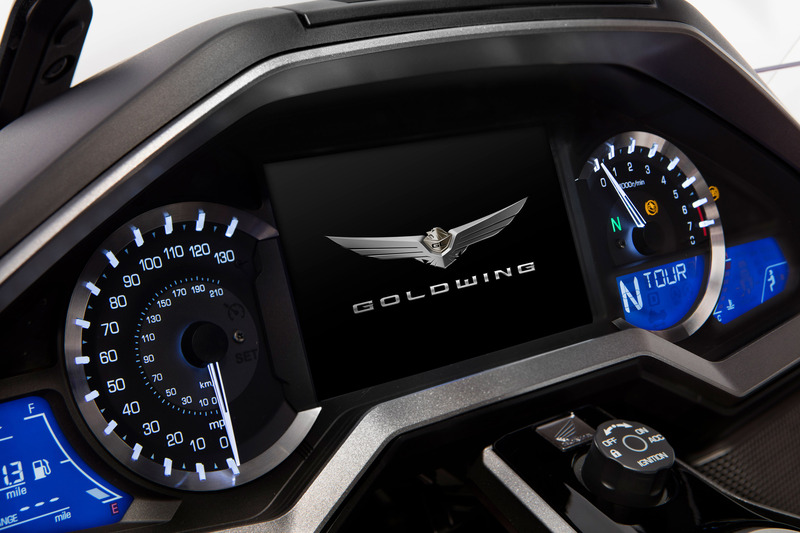 The impressively-style Gold Wing TFT dash. 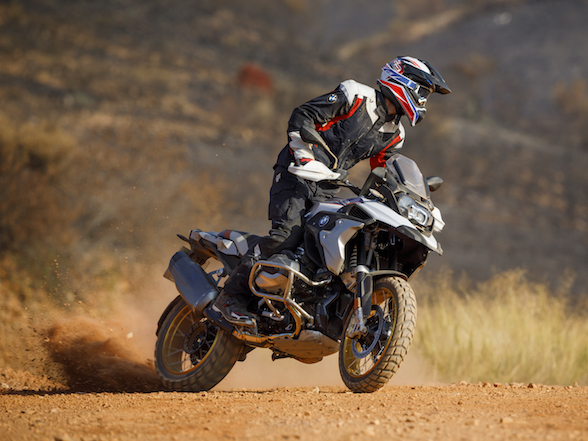 The DCT mode also affects the suspension settings, with the ride becoming firmer and more responsive the sportier the mode. To be honest I never really noticed much difference because even in its softer guises the poise and balance of this huge beastie is never anything less than amazingly accomplished. I say it’s a beastie, but compared to the bike it replaces its actually noticeably more svelte, registering an impressive weight loss of 37kg. It’s physically smaller, too, though rider and passenger accommodation doesn’t seem to have been compromised. Honda has adopted the same suspension technology BMW has featured on its big tourers for many years, and that’s a rigid front fork system that doesn’t contain the suspension like a traditional telescopic fork. 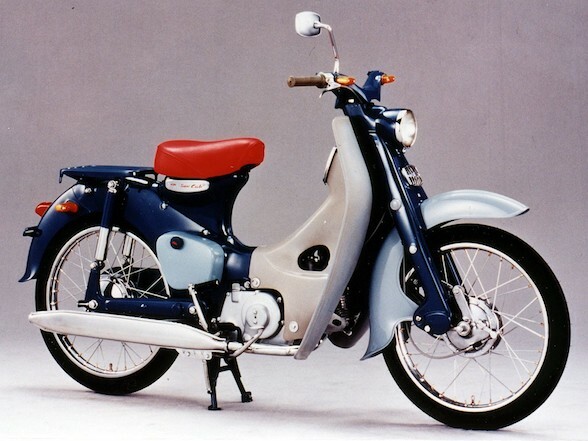 The handlebar is no longer connected directly to the steering-head and so steering is operated via tie-rods. This seems like a recipe for wooly vagueness when confronting a series of corners, but that’s not the case. For a big bike, this thing really handles remarkably well. An airbag? On a motorcycle? 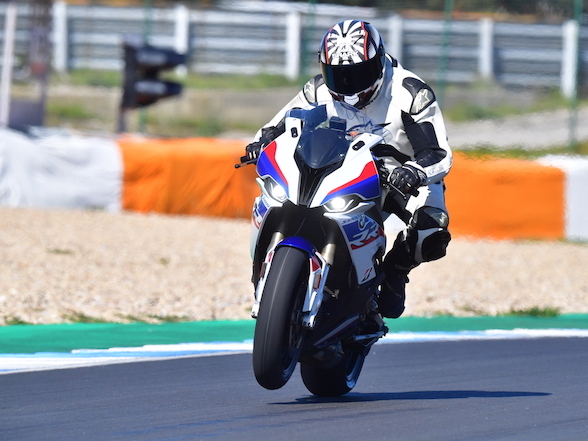 The new suspension arrangement also provides tangible benefits when combined with the linked brakes which are, quite simply, stupendous. 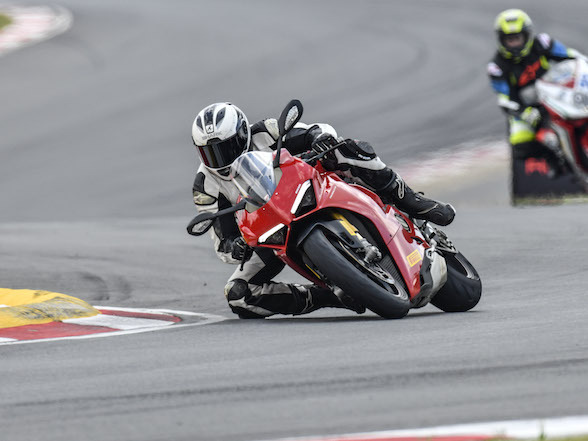 Slam on the stoppers and you stop, quickly, but also while remaining stable because the front end doesn’t dive like you expect with a traditional fork. Even if I stop writing now and simply list all the features of the new Goldwing I’m going to exceed my strict word count, so let my try and highlight the really good bits. The cockpit instrumentation is fabulous, combining classy dials for speed and revs with a TFT screen for on-board functions that controls everything from the suspension to the gearbox and all points in between including the heating, music, phone connectivity and voice control. There’s a keyless fob so you just get close enough to the bike and it can be unlocked and started, and the centrally-locked panniers also unlock themselves. 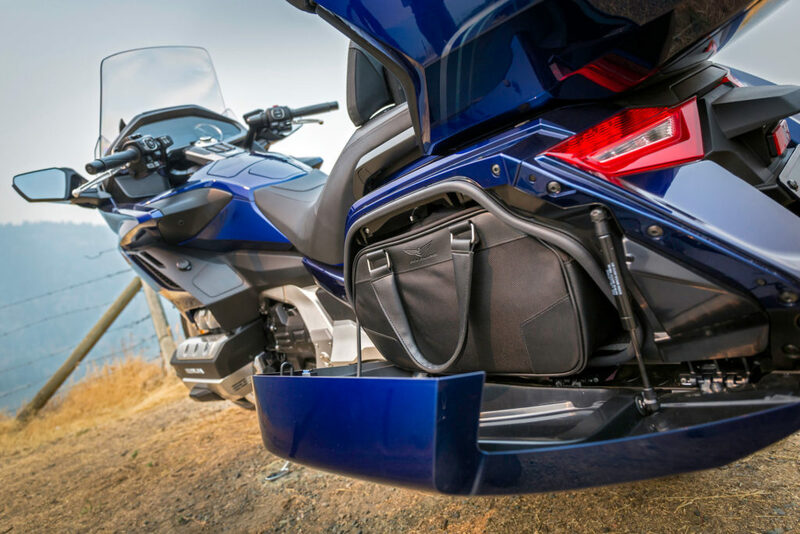 The new Gold Wing panniers are smaller, which is disappointing. You can engage a start-stop system as found on many cars, so three-seconds after coming to a halt the engines cuts out, and within a nano-second of you touching the throttle it fires back into life and you’re on the move again. 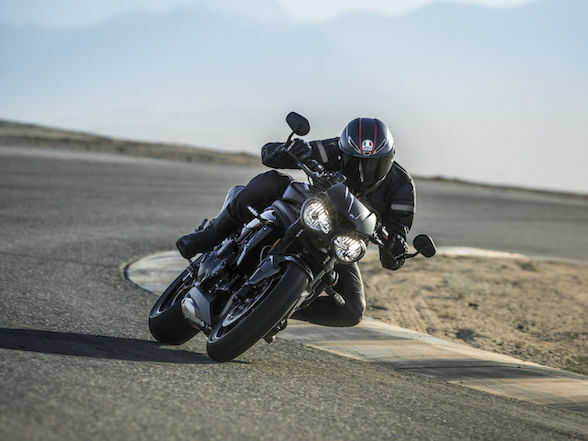 There’s a very useful reverse gear for those awkward moments when you park nose-first into a downhill parking space; and there’s cruise-control for giving your throttle hand a rest on those long stretches of highway. 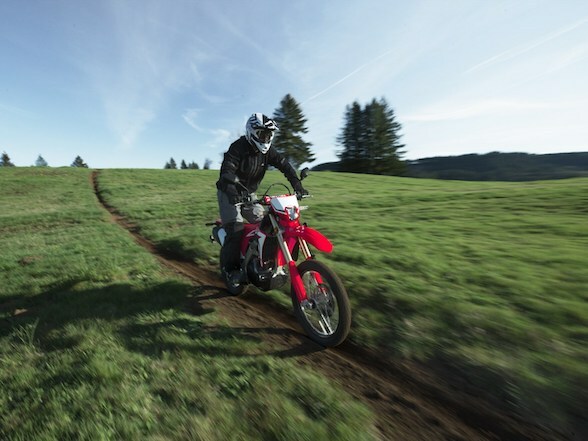 Fuel tank capacity has been reduced, but the increased efficiency of the engine means the range remains the same at about 400km if ridden gently. 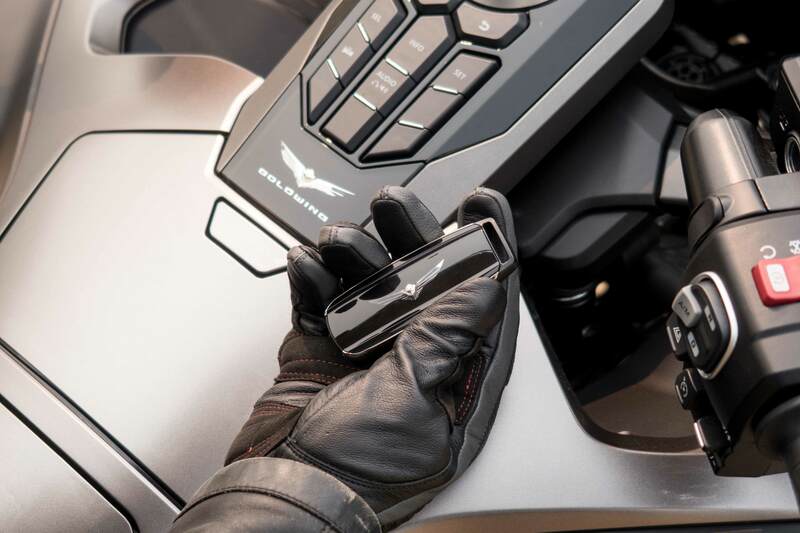 The new Gold Wing comes with a keyless ignition, of course. 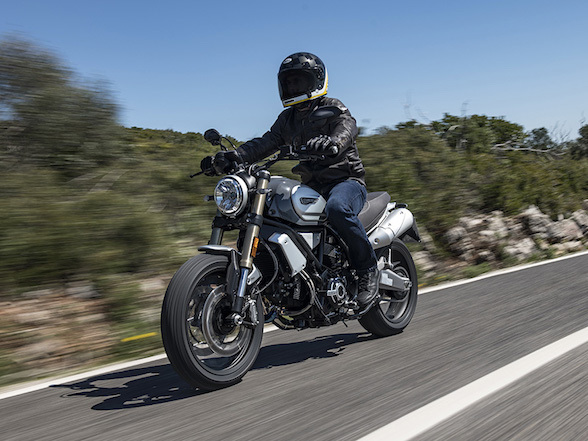 The panniers have shrunk in size, which is a bit of a disappointment, but the topbox will still hold two full-face helmets, an essential feature for a true grand-tourer. 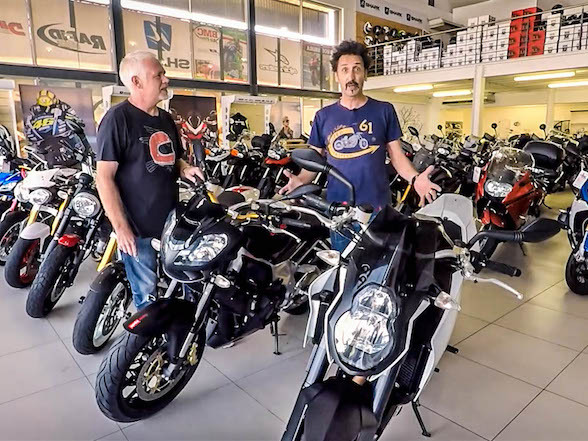 There’s much more, but I’ve already exceeded my editor’s word-limit so that will have to do for now, other than to say R392 000 will get you the Gold Wing DCT in your garage. Opt for the manual version (a silly mistake, I reckon) and you could save R25 000. For more go to the Honda website.